How do you feel about your facebook friends ? I like them; some are my good friends in real life, some are just people I know, and I have only a vague idea who some of my facebook friends are. But this woman loves them all; she loves them so much that she permanently inked them onto her arm. 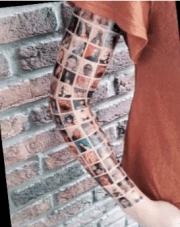 But things are entirely different for YouTuber Suzyj87, who videoed the whole process of tattooing her facebook friends – all 152 of them. Well ok, so there’s not a huge amount of pain, and it arguably looks decent, but, then again, there’s the thought that you will bear the thumbnail pictures of those 152 people for all your life, with no possibility of erasing them, and a small posibility of modifying it… that’s not for me, thanks. UPDATE: Seems like the whole deal was simply a publicity stunt – the tattoo isn’t for real. Props to Iceman for letting us know.